Store-bought pesto tossed with pasta, peas and pine nuts are perfect on their own. 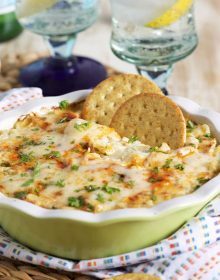 Top with grilled shrimp and this is suitable for entertaining those last-minute dinner guests! My foodie friend, Colleen from Souffle Bombay, was thinking about just what cookbook it was that made her fall in love with cooking recently, then she decided to ask the same question to a number of her foodie friends, myself included, and #CookbooksandCalphalon was born! Enjoy 17 food bloggers stories as well as the recipes that go along with them as we celebrate our love of cooking and the perfect pairing of Cookbooks & Calphalon! My answer…..Barefoot Contessa Parties! I learned how to cook by reading cookbooks and magazines. Basically, my fancier fare was all instructed by either Ina Garten or Martha Stewart. It really depended on my mood. I wanted to be the queen of easy entertaining in my early 20’s. It just seemed so glamorous and exciting. The problem back them was….my friends were more of the “hey, let’s go clubbing at 10:00 PM on a Saturday night” and I was more “Hey, let’s stuff our faces until we slip into a food coma at 10:00 PM on a Saturday night.” Ina’s “Parties” book really saved the day when I did end up feeding my club hopping friends because all the recipes are super easy and impressive. 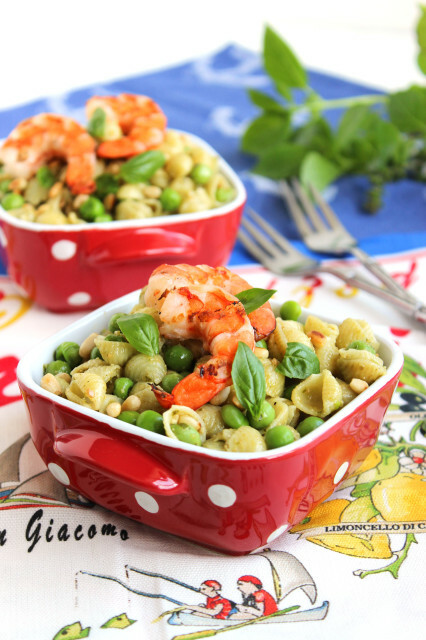 Like Pesto Pasta with Peas…..and grilled shrimp! Ina’s recipe doesn’t call for grilled shrimp but I added it because it makes the dish seem more grown up….and less likely that you would be serving this to your kids on a weeknight. Even though it’s so easy it’s definitely doable on a weeknight. Especially if you cheat and use store-bought pesto. Which I did. Dinner on the table in 15 minutes. FLAT! This wouldn’t be complete without a fun giveaway for you to enter…you can’t cook without cookware and you can’t use cookware unless you can cook…right? So take a moment to enter our awesome Cookbooks & Calphalon Giveaway for a chance to win one of two prize packs containing a huge bundle of cookbooks AND amazing Calphalon cookware! Yep, we’re going to help you start whipping up some of your own masterpieces. Also, now through September 1st, Calphalon is celebrating couples! From the first meal they create together in their new home to the meal they share on their 25th anniversary, couples cook up memories! The cookware they choose serves as the foundation for which these “Couples Cooking” memories are made. Calphalon wants to recognize these #CouplesCooking moments by asking them to share pictures of the meals they cook together for a chance to win $1,000 in Calphalon cookware! Calphalon is inviting couples to post photos of the meals they prepare with their significant other on Calphalon’s Facebook page. To enter, couples will be asked to share why the dish is unique or special to them and use the hashtag #CouplesCooking. How fun is THAT?? Follow the #CookbooksandCalphalon fun on social media for great recipes, tips and more and good luck in BOTH giveaways! 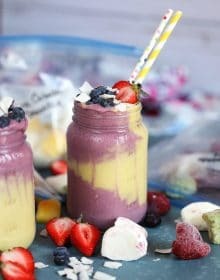 AND don’t forget to check out all the fun recipes and stories that my blogger friends are sharing! 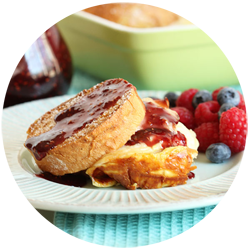 Tomato Jam – Healthy. Delicious. 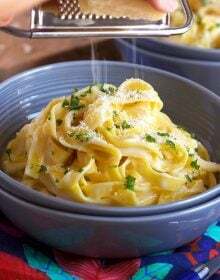 Cook the pasta in a large pot of salted boiling water until al dente, approximately 8-10 minutes. Drain and toss with the pesto in a large bowl. Cool to room temperature. Brush the shrimp with olive oil and season with salt and pepper. Grill the shrimp until bright pink and cooked through, approximately 3-5 minutes. 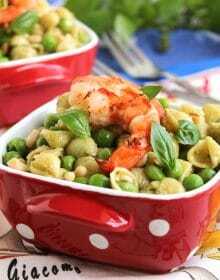 Toss the pasta with the peas, pine nuts, salt and pepper. Top with grilled shrimp and serve immediately. 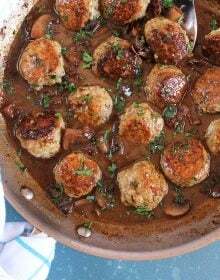 This dish can be served warm or at room temperature. I spent every Friday night for the longest time in the early ’90s making the most complicated recipes I could get my hands on from the Best of Gourmet series. I totally am with you on food coma by 10:30! I love that you can put an impressive meal on the table in 15 minutes flat! I adore Ina Garten too. I have all of her cookbooks. This is one recipe I’ve never tried though. Love that you grilled the shrimp. It is a great way to add even more flavor. Beautiful dish Kellie! Your shrimp are gorgeous!! That IS a great book…Ina always makes it look so easy (and usually it is)! Martha on the other hand…never was a fan, funny right? I think I am too laid back for her. Anyway, I was the girl who wanted to go clubbing and dance the night away as well as they girl who wanted to cook up amazing dinners…I had a foot in both worlds! Pesto is a staple at our house. I tend to try and fancy things up with fresh herbs. This looks like incredible shrimp!! I love cooking with shrimp! I’m loving the combination of grilled shrimp and pesto, looks wonderful! I love Ina! 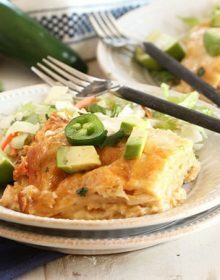 I’ve made this dish before without the shrimp, but that is such a great addition! Perfect for a summer meal! 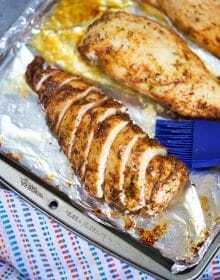 I love everything in this recipe … and I love how quick and easy it is! 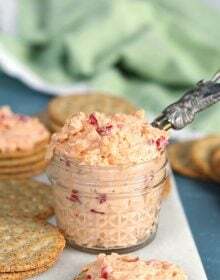 Kellie, this looks great, and yes to Barefoot Contessa! Ina’s recipes are so approachable and delicious – good for families AND good for late-night dinners after the clubs! Gosh, I love Ina. I’ve never had a fail with her recipes. I’ve been cooking shrimp more, and love it, so I’ll have to try this! There wasn’t a cookbook that made me fall in love with cooking. I had to move back in with my parents because of health issues and I started watching the food network all day. I started cooking for my parents so we would eat something I liked. I feel in love with cooking. I love baking as well. ooooh – great pick! I love Ina! This looks like the perfect recipe. Kellie, these photos are great!! 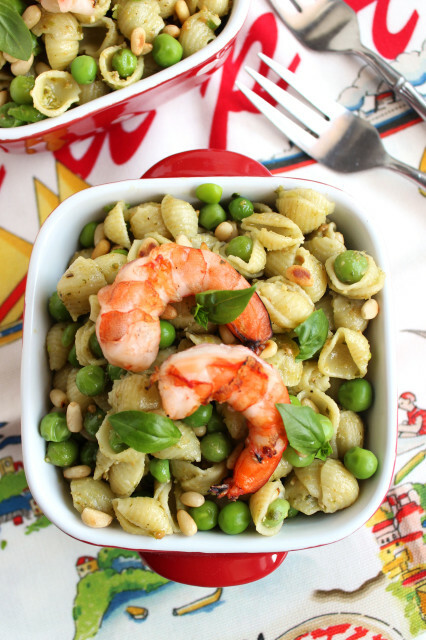 I’m getting so hungry looking at this pesto pasta salad. Absolutely mouth watering!! Love how colroful it is! That wouldn’t last long at my house! Beautiful dish!! I love Ina – Her recipes make me feel so fancy. I want to cook like Ina but I kinda want to be Martha (sans prison bid). I stopped clubbing long ago, since I married young. Don’t miss the clubs, though I love to dance. Food comas are a much better way to live, anyway. Gorgeous! 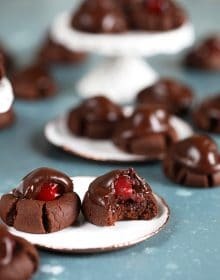 I absolutely love any of Ina’s books – her recipes always turn out fabulous! Lovely dish, looks so delicious and healthy.. The addition of those gorgeous shrimp really does make this a fancy feast. I love how quick it is too, Kellie! Such a lovely story. I think you and I would have been best friends in my early 20’s. I’m so much more of a home body than most of my friends. By the way, I really like the addition of the shrimp. It gives the dish a pop of color! 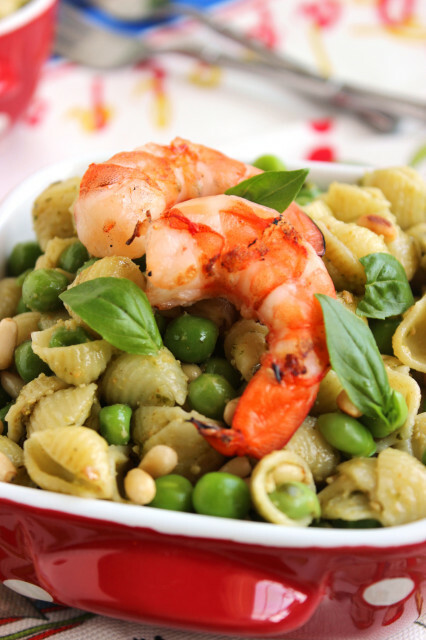 I love peas, pesto and shrimp! 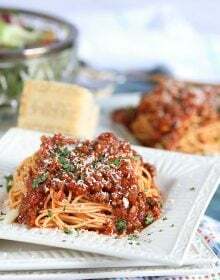 This is such an easy, delicious meal! I need to pick up that book by Ina–I love her recipes anyway and now that I have a nice space to entertain, I think it will encourage me to have more people over! So glad you shared this!